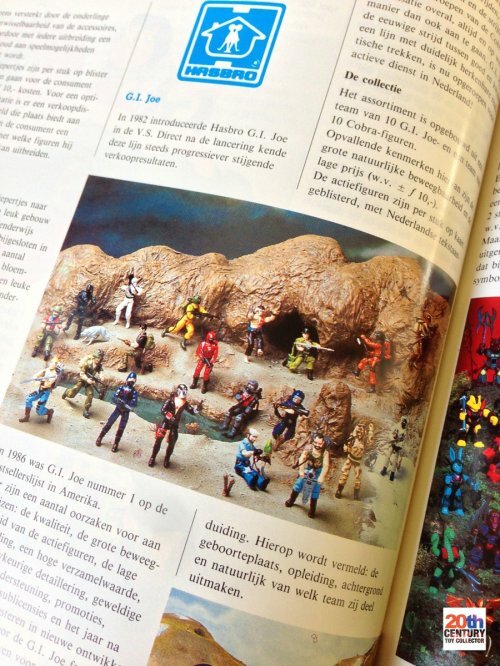 The availability of the original vintage 3.75-inch action figure toy line G.I. Joe in Europe in the 1980′s and 1990′s was everything but a uniform affair. If you thought that the availability of Transformers in Europe in the 1980′s was confusing, with all the various distributors involved, the G.I. Joe line takes this to a whole new level and way up into the stratosphere. Part of this is due to the way that the G.I. Joe line’s European history is entwined with another toy line called Action Force from a British company called Palitoy. The two lines ran from 1982 to 1994 and were available in most west-European countries during this time span in some way or another. 1987 was a landmark year in European G.I. 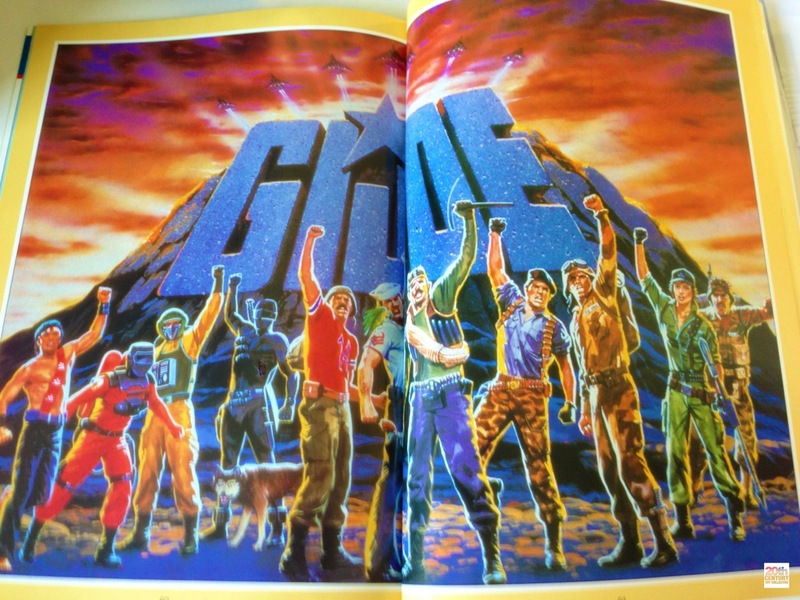 Joe history, because that is when Hasbro took over the reigns from Palitoy and properly introduced the G.I. Joe line in Europe. I’ve been investigating the availability of G.I. Joe toys in Europe during said period and I currently have a mountain of information, which I am structuring and compiling into an all-encompassing article that will be published on this site. Although it’s probably going to take many weeks before I will be able to publish that article I would like to share some information today with you on that landmark year of 1987 and specifically on the mainland European area, because that year and region holds most nostalgic value to me. Before Hasbro truely launched the G.I. Joe line in Europe, the British company Palitoy had been active selling 3.75-inch action figures under the name of Action Force. During their very succesful run Palitoy even imported several of Hasbro’s G.I. Joe action figures and vehicles (sometimes repainted or with different stickers, which makes for very nice variations!) and sold them under the Action Force name as well to further flesh out the line. Due to a shift in strategy from Palitoy’s parent company the line all but died in 1986 and Hasbro seemingly saw their chance and acquired the intellectual rights to the Action Force line. The time now seemed right for Hasbro to properly launch their G.I. Joe toys in Europe themselves instead of going through Palitoy and this is what occurred in the spring of 1987. G.I. Joe – Dutch pack-in catalog: G.I. Joe side (1987) MB International B.V.
Distribution in the UK was done by Hasbro Industries (UK), Ltd and the toyline there retained the name Action Force, while France, the Benelux, Italy and Switzerland were introduced to the G.I. Joe brand, distributed by the various MB subsidiaries, as was common in mainland Europe in the 1980′s for Hasbro toys. Notable absentees here are two other major markets where MB was active and those are Spain and West-Germany. Spain was introduced to the G.I. Joe line a year later (in 1988), while West-Germany had to wait until 1989 and saw the line introduced under the Action Force name instead of the G.I. Joe name, along with a different background story (Action Force was a futuristic fighting force that defended Earth against enemies from both outer space and from Earth itself). G.I. Joe – Dutch pack-in catalog: Cobra side (1987) MB International B.V. But today I would like to focus on 1987 and specifically the roll out of the line in continental Europe, i.e. in France, the Benelux, Italy and Switzerland. I was particularly interested in the product codes of all the toys from this first release. I like making lists and sometimes patterns will emerge from looking at the number sequences, as they did in this case! Before we look at the list of product codes, here’s a short explanation of what these numbers mean. Milton Bradley (MB) was the company that was responsible for the distribution of Hasbro toys in continental Europe from 1985 until the early 1990′s. MB used to be an independent company and had a presence in Europe that dates back to 1968 with the opening of their first international subsidiary MB International B.V. in Ter Apel, the Netherlands. MB was taken over by Hasbro in September 1984. By that time MB had expanded their presence into a total of nine European countries and possessed a distribution network that covered a large chunk of Europe. Because MB had their own methods of distributing and numbering products the MB product numbers on Hasbro branded toys were often different from the numbers that Hasbro used. MB used a 4-digit code, followed by a 2-digit suffix code. This code can be found on the packaging of all MB distributed toys and in their dealer/trade catalogs. Generally, the first 4 digits represent a unique number, which is assigned to a specific toy. 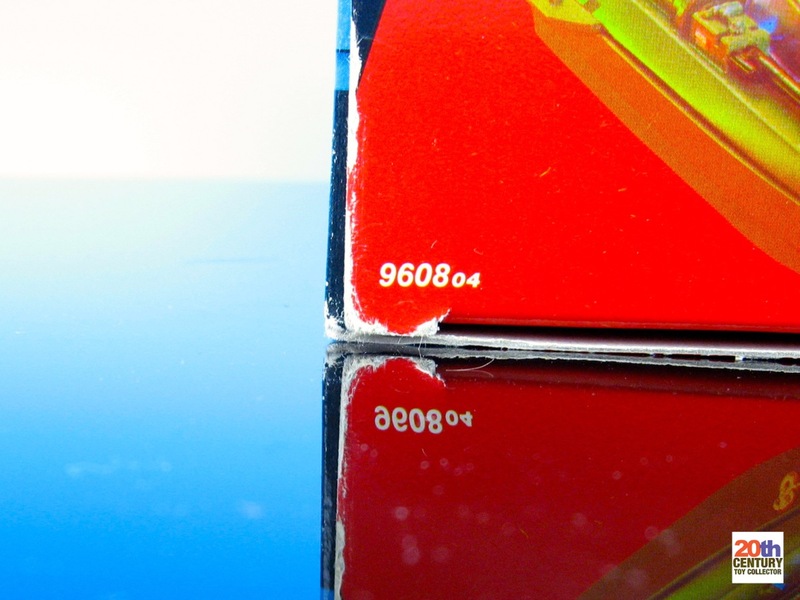 The 2 digits that follow, which are usually printed in a smaller size, generally indicate the language variation(s) of the packaging. Here is an example of the packaging of the 1987 Cobra Water Moccasin (with Dutch language on the packaging). France obviously got toys packaged with language code 02, which is French. Distribution was done by Hasbro S.A. and/or MB France S.A.
Italy got toys packaged with code 03, which is Italian. Distribution by MB Italy S.r.l. The Netherlands got packaging with code 04, which is Dutch. There are also several reports of some Dutch toy stores also carrying toys with code 98, which is the bilingual French/Dutch packaging. Distribution by MB International B.V.
Belgium primarily got packaging with code 98, which is bilingual French/Dutch packaging that was specifically made for Belgium. (Dutch and French are the two main languages spoken in Belgium). Belgium apparently also got the 04 code packaging, which is the all-Dutch packaging, because the Belgian Hasbro-MB office address is specifically mentioned on the Dutch packaging. This 04 code packaging was probably primarily available in stores in Flanders, the Dutch speaking part of Belgium. Although there is no mention on the 02 code French packaging about Belgium, it’s quite possible that the 02 code French packaging might have also been officially available in Wallonia, the southern, French speaking part of Belgium. Distribution by Hasbro-MB N.V./S.A. Official languages of note in Switzerland are German, French and Italian. I have no confirmation yet that Switzerland was included in the 1987 G.I. Joe launch. If it was, the Swiss would probably have had to settle for the 02 and 03 code packaging, which is French and Italian, because there was no German G.I. Joe packaging manufactured in 1987 (due to the absence of West-Germany from the 1987 roster). Distribution would have been done by MB (Switzerland) A.G.
Little is known about the situation in Luxembourg, but the most likely scenario is that Luxembourg got the same packaging as Belgium did, which is code 98 with French and Dutch on the packaging. Distribution in Luxembourg was probably done from Belgium through Hasbro-MB N.V./S.A. So what was the inaugural 1987 line up for continental Europe? Well, as you might have gathered from the catalog scans above it consisted of 20 action figures and 19 vehicles and sets. What I was most interested in is if there was any way to determine what sort of assortments were available, because (unlike Hasbro) MB never printed assortment numbers on their packaging. 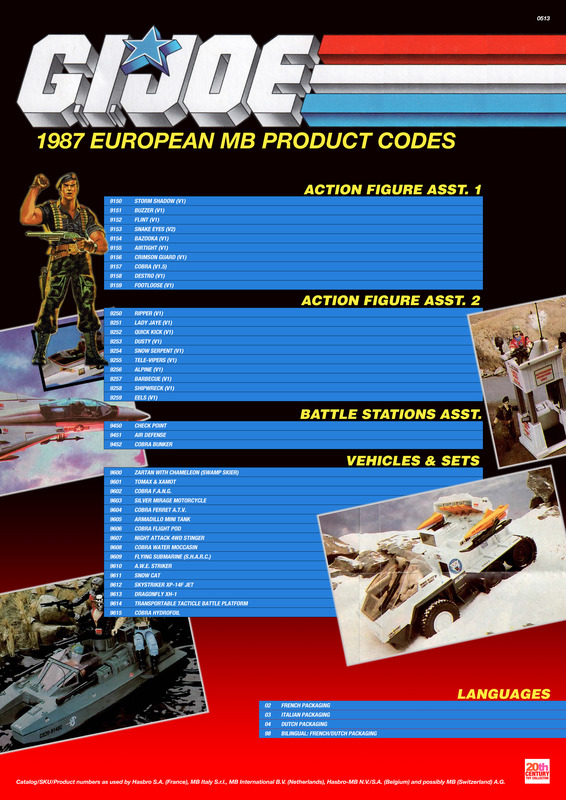 Dealer catalogs are usually the only source for assortment codes and unfortunately I do not own any 1987 Hasbro/MB dealer catalogs for the France/Benelux area. What’s an assortment? Well, some toys (usually the smaller toys) cannot be ordered on an individual basis by retailers and are only available as part of an assortment, i.e. a mix of several same-class items. By writing down all the product numbers on the packaging I was able to create the following list, which I was able to group into 4 sections. Have a look at the list. You can click on it for a closer look. I’m pretty convinced that these ten action figures were part of one and the same assortment, because I have a 1988 Spanish dealer catalog from MB, which also has 20 action figures nicely grouped into two assortments of 10 each. This same catalog shows that each assortment came with 36 action figures, so it’s a pretty safe bet that these 1987 assortments in France, Italy and the Benelux also came in a factory case of 36 pieces. If you look closely you can see that there are 11 G.I. 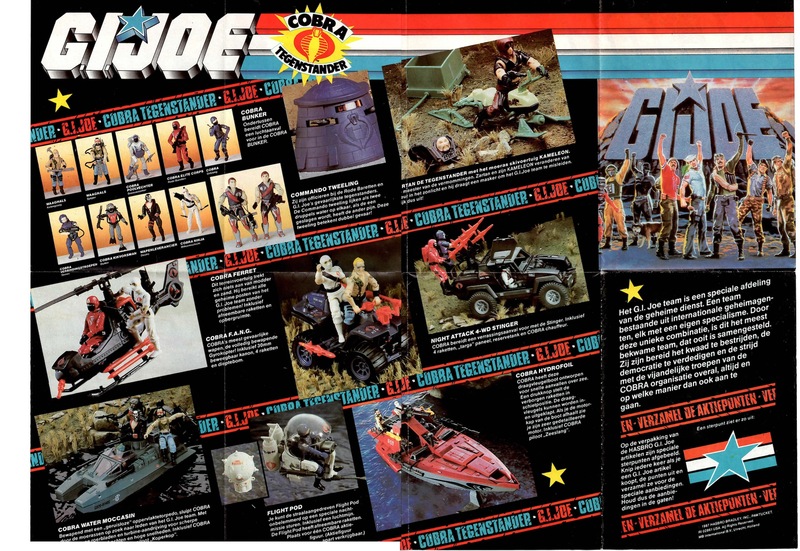 Joe action figures and 9 Cobra action figures. These have been divided quite nicely over the two assortments. Assortment 1 contains 5 G.I. Joe action figures and 5 Cobra action figures and assortment 2 contains 6 G.I. Joe action figures and 4 Cobra action figures. But hold on! Aren’t the two Crimson twins Tomax and Xamot action figures too? Well, technically they are action figures, but they were not sold as part of an action figure assortment as we will soon see. This, by the way, brings the balance between the Joe’s and the Cobra’s to an equal 11 vs 11. G.I. Joe battle stations assortment (1988) MB España S.A.
As you can see these battle station assortments came with 12 pieces inside a factory case. But what’s even more interesting is that we see mention of an assortment number, being 9033. This is the assortment number that MB España S.A. used for this particular battle station assortment in 1988 and there’s quite a good chance that this assortment number was used by the remaining MB countries as well. 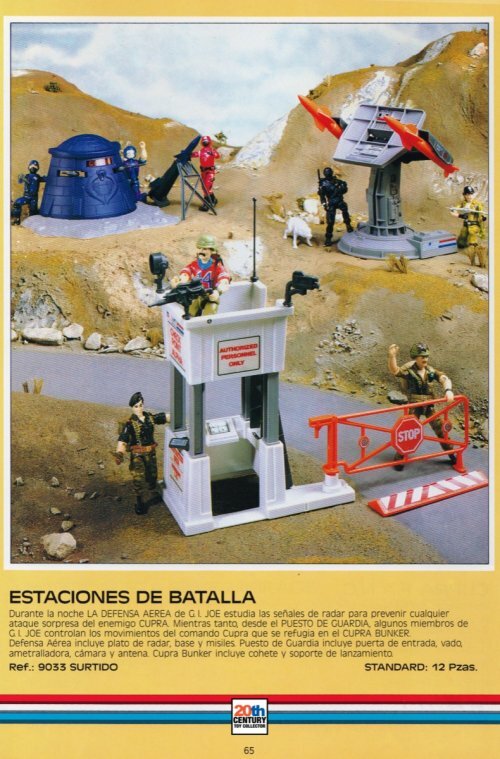 Notice also how all three battle stations photos in the 1987 pack-in catalog are directly copied from this particular single diorama photo! Cool. As you can see Tomax & Xamot are part of this listing with product number 9601, same goes for Zartan and his Chameleon Swamp Skier. As you can see the items are also arranged from small to large, with the Transportable Tactical Battle Platform and the Cobra Hydrofoil closing the list. Great insight into European Joe’s, thanks! 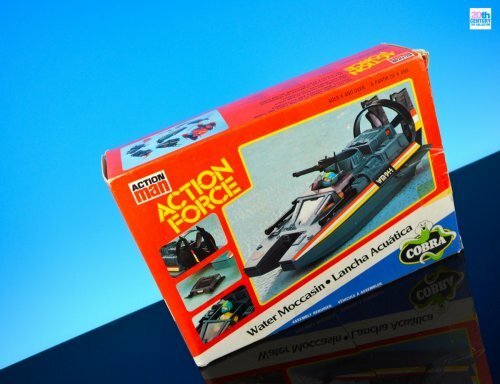 I never knew about the Action Force link to Joe, but seeing the packaging, it does look very familiar! Reading your great (as always) article I noticed that the Speelgoed has a Battle Beasts section. Is it possible to get a full size pic of the page ? Have you more Battle Beasts related articles in your Speelgoed collection ? Maybe you could do a full post dedicated to this great line. 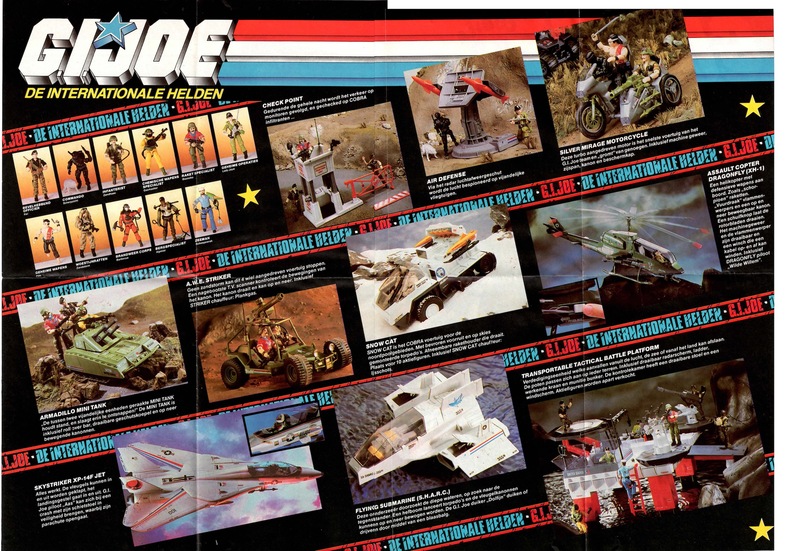 Hi Sylvain, it’s just a small photo and a short write up of Hasbro’s line in 1987. There’s nothing new in there about BB compared to other countries, but I will see if I can include it in a future article! As far as I know only the first series of BB were released in Holland. They were all the same as available in the rest of Europe (except Spain), so nothing exciting and no variants as far as I know of. Thank you so much for the info! However, I suspect that GianniToys never actually distributed the G.I.Joe-related Action Force figures in Italy, as no collector I know never ever either saw one back in the days or found a stock remain in a shop. Probably because the cartoon was far away from appearing on TV (it was aired for the first time in 1987 over here) and in the end the company didn’t want to invest in a series with no supporting show. Really a pity, finding certain action figures, such as Cobra Commander, Firefly or Baroness, would have been a dream when I was a kid!